Let us handle the back office functions, so you can focus on giving your apprentices an outstanding education. Your team of tutors and staff want to focus on the delivery of apprenticeship provision, not fight with the administrative burdens that come along with it. Our dedicated data team, MIS systems and specialists take on this for you with a complete back-office function. This will remove the challenges of having to implement bespoke MIS systems, reporting and additional staff needed to ensure your provision is Education & Skills Funding Agency (ESFA), audit and Ofsted compliant. Our services cover all the basic elements of finance and data management, with additional services offered for audit, staff training and consultancy if required. Our systems are purpose built specifically for apprenticeship data management, which ensures error free submissions to the ESFA for funding claims. With experience in supporting 100s of employers set up their own systems for payments and provision, we will support with the setup of systems such as IDAMs, IM Hub and AS accounts*. 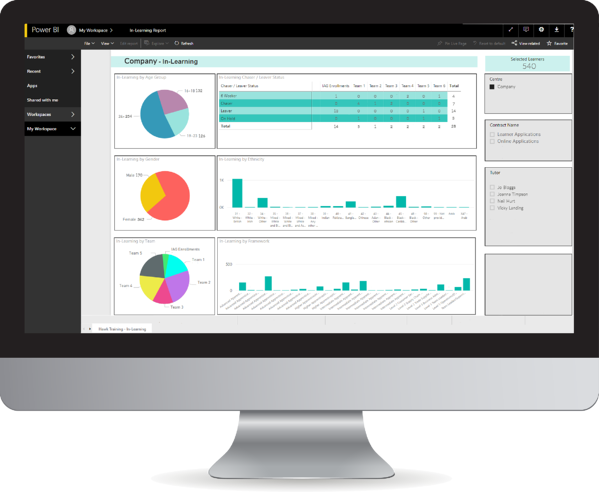 We use Microsoft’s Power BI software to create stunning data analysis screens and tools, enabling you to easily access and visualise your data in just a few screens. We have used our very own sequential flow since 2012, housing apprenticeship provision documents in one place, meaning you stay compliant with any standards set by the government. With a dedicated data team, MI systems and specialists available, you are provided with complete back-office functionality. A personal point of contact will be there to offer specialist advice and expert knowledge as part of a friendly, reliable service so you are never left in the dark. Get simple, easy to understand recurring reports that drill down to important statistics such as achievement rates, equality and diversity, additional learning or social needs and forecasted results. We keep your data safe no matter what it is. We are fully compliant with the Data Protection Act 2018 and the General Data Protection Regulation (GDPR). With many years of experience ourselves of Ofsted Inspections and audits, we have a wealth of knowledge to support providers and employers in preparation for their next inspection/visit. Based in Twickenham, we offer complimentary room hire for Managed Services customers at our state of the art centre. We provide flexible facilities for different types of events and a boardroom for those important meetings. Equip your tutors with the skills to deliver excellent teaching and learning with our range of accredited and non-accredited courses. House all your documentation in one place and ensure everyone is using the same, correct documentation for programme delivery. Hawk Training first developed our own Sequential Flow in 2012 in a move to become a completely paperless organisation and prevent obsolete documentation being used accidentally. We have been externally audited several times since the system came into place and through centralised and standardised paperwork have achieved an accuracy rating of over 99%. We now offer the sequential flow as a licensed product which includes free set up and guidance, including ESFA-licence compliant templates and paperwork to help you get started quickly. Our unique combination of technical expertise and solid track record as an outstanding training provider with over 30 years’ experience within the sector means that we can offer expert advice and support to new employers and providers entering the sector. We work shoulder to shoulder with our clients to select the best consultancy solutions for their needs and objectives. We can supply best practice solutions from apprenticeship delivery models to CPD, ESFA compliance, mandatory quality marks and Ofsted. Our dedicated Programme Design Team can facilitate individual employer content and delivery requirements. With expert knowledge on programme content and delivery mechanisms, the team will support you in building a programme that suits your business needs and represents your business’ identity. Where established internal training programmes exist, the team can also support to embed this where the two align.